Alojamento Local enjoys a central location in Albufeira, right on Fisherman's Beach. It features serviced apartments and studios with a private balcony. An airport shuttle service is available. Soldoiro Apartments offers self-catering studios and apartments just 1-minute walking from an Albufeira's beach, Praia da Oura. It has an outdoor pool with a pool bar serving beverages and snacks. 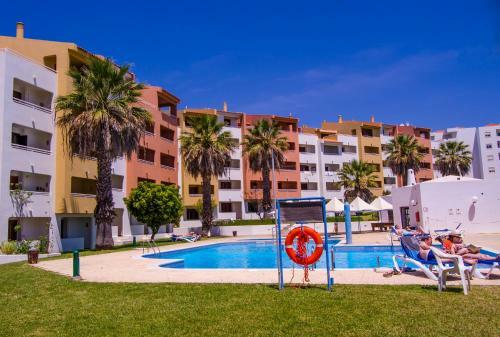 Located in the centre of Santa Eulália - Oura in Albufeira, this unit is 300 metres from Oura Beach. Bicos 303 features access to a green garden, sun terrace and an outdoor swimming pool. Located in Albufeira, Bellavista Avenida has an outdoor swimming pool and a garden. The property is 1.3 km from Old Town Square and 1.6 km from Oura Beach. The studio features a satellite TV, balcony and a seating area.